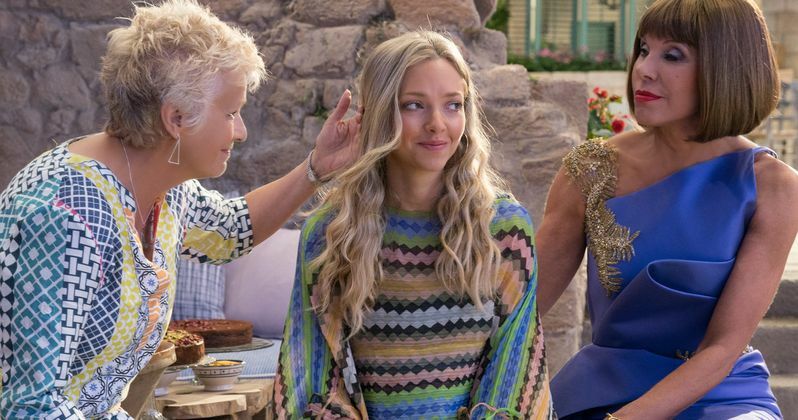 The first trailer for Mamma Mia: Here We Go Again has arrived online. In Hollywood, it seems like it's never too late to do a sequel and that's certainly the case with Mamma Mi! right now. The original was a massive hit and it's honestly surprising a sequel wasn't made earlier. But Universal Pictures has just released the trailer for Mamma Mia 2 online, giving us our first real look at the sequel, which arrives in theaters next summer. Ten years after Mamma Mia! brought in $609 million worldwide, you are invited to return to the magical Greek island of Kalokairi in an all-new original musical based on the songs of ABBA. With the film's original cast returning and new additions including Lily James (Cinderella). This is easily her biggest role sing starring in Edgar Wright's Baby Driver earlier this year. The musical comedy will open on July 20, 2018, putting it right in the heart of the summer movie season. Mamma Mia! Here We Go Again is produced by Judy Craymer and Gary Goetzman, producers of the original film. Craymer is also the creator and producer of the worldwide smash-hit stage musical. The cast for the movie brings back plenty of familiar faces. Reprising their roles from the original Mamma Mia! are Academy Award winner Meryl Streep as Donna, Julie Walters as Rosie and Christine Baranski as Tanya. Amanda Seyfried and Dominic Cooper reunite as Sophie and Sky, while Pierce Brosnan, Stellan Skarsgård and Oscar winner Colin Firth return to play Sophie's three possible dads: Sam, Bill and Harry. As the movie goes back and forth in time to show how relationships forged in the past resonate in the present, James will play the role of Young Donna. Filling the roles of Young Rosie and Young Tanya are Alexa Davies (A Brilliant Young Mind) and Jessica Keenan Wynn (Broadway's Beautiful). Young Sam will be played by Jeremy Irvine (War Horse), while Young Bill is Josh Dylan (Allied) and Young Harry is Hugh Skinner (Kill Your Friends). Hollywood has had mixed success with long-delayed sequels. Can Mamma Mia 2 be one of the ones that actually fins success so many years later? They have a lot of the same pieces in place and this certainly seems to be in line with what people who liked the first movie would enjoy. Be sure to check out the first Mamma Mia! Here We Go Again trailer, courtesy of Universal Pictures, for yourself below. Can Equalizer 2 Gun Down Mama Mia 2 at the Box Office?